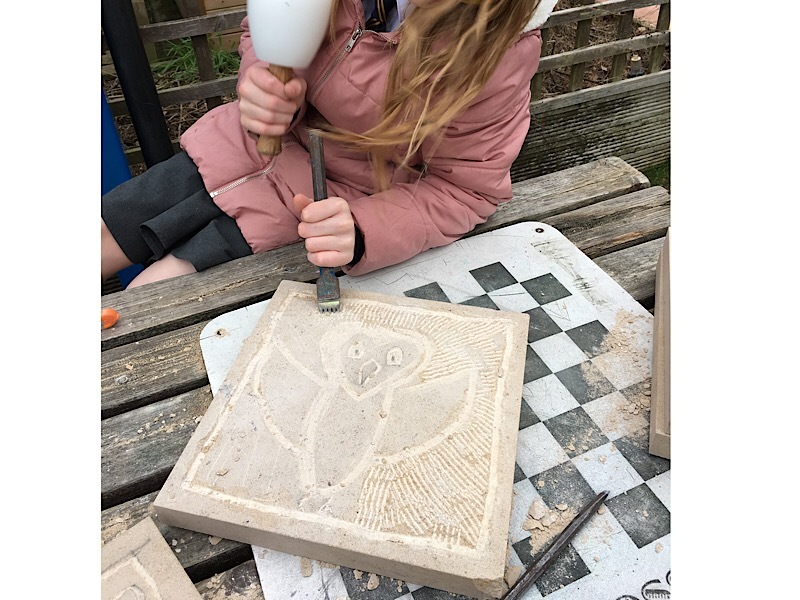 Ever thought of having your school children delivering a permanent work of art, Stone carving is the answer? How proud would you be to see your children doing something practical, something that doesn’t involve a gadget, something that is a traditional craft, something that the ancient Egyptians were experts at? St Marys RC Primary School in Chorley commissioned us and our artist to create a series of carved sculptural tiles that are mounted in a frame on the school wall. The session took a morning, involved an interview on the radio (Media Stars!) and 20 children from the School Council, even the headteacher got involved. 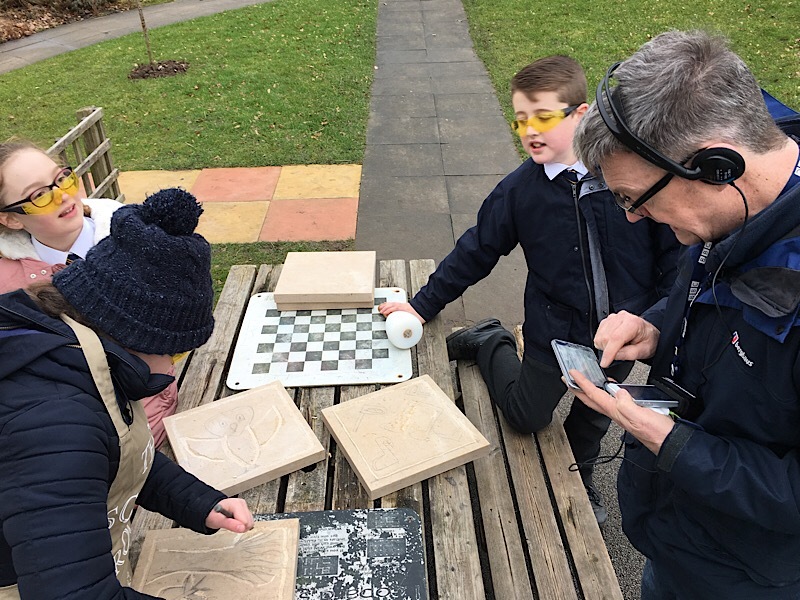 Design, craft skills and sculpture was in the mix for the morning and even included some music and expert tuition from Mike, our resident stone sculptor. The stone we use is a soft cut limestone, ideal for carving by children and for creating detail in stone. Our sessions come with all the PPE and tuition and we are fully insured. This is a highly rewarding project and something that the children will talk about for years to come. ‘We really enjoyed our morning, we have never done anything like this before and Mike was really good at helping us. His music was a bit old fashioned though!’ said Charlotte , aged 9yrs. 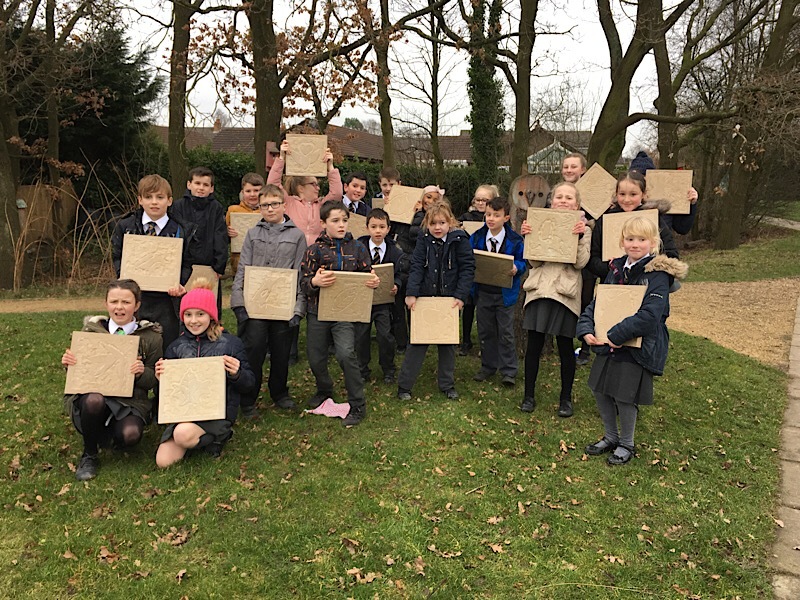 ‘Our school have worked with Playscape Engineering on our woodland garden resource, but this session was something different and a great success’, said Patrick Smyth, Headteacher. The woodland area includes a fire pit, shelter, insect houses, woven willow panel fencing and hedgerow and some great woven willow shapes on the fence.